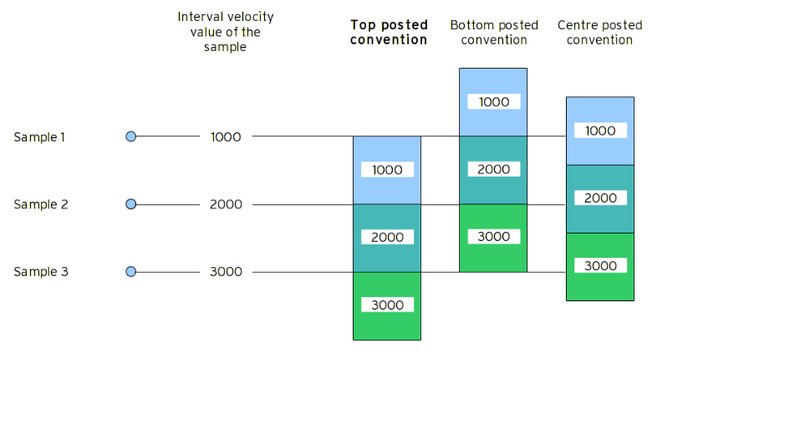 Insight uses a top-posted interval velocity convention, i.e. an interval velocity sample defines the time that the velocity changes (the top of the interval). Other software may use a different convention. This can lead to incorrect results when loading interval velocities created elsewhere. We recommend transferring velocity models between software packages in RMS or Average velocity. Use the Velocity Conversion process to safely convert velocities between different formats. Interval velocities indicate the velocity applicable over a time (or depth) interval. Because an interval is defined by a start and end time, there is ambiguity in how to interpret an interval velocity at a sample time. The velocity is V starting at T.
From Tn to T(n+1), the velocity is V.
The velocity is V ending at T.
From T(n-1) to Tn, the velocity is V.
The velocity is V, centred at T.
From T(n-½) to T(n+½), the velocity is V.